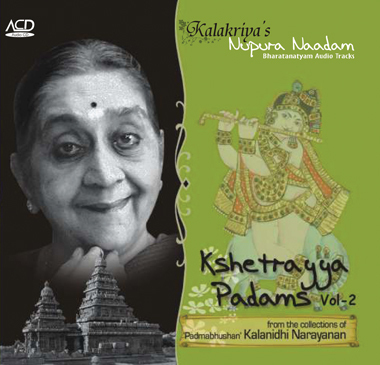 This audio CD carries an exclusive collection of padams by Kshetrayya, the 17th century Telugu poet/composer. Selected by 'Padmabhushan' Smt.Kalanidhi Narayanan, the celebrated Abhinaya exponent, they present a sizzling fare of Sringara rasa. An ideal tool for practicing Abhinaya or choreographing recitals.